Apropos Of Something hosts Ellen Daniels and Nancy Laurence talk with Warren Craghead III, prolific artist and creator of TRUMPTRUMP Volumes 1 + 2 on what’s between the lines of his bold illustrations; and Larycia Hawkins PhD, UVA Asst. Professor, Depts. of Politics and Religious Studies, Faculty Fellow, Institute for Advanced Studies in Culture on the possibilities for multifaith solidarity in today’s divisive climate. Apropos Of Something hosts Ellen Daniels and Nancy Laurence talk with Richard Guy Wilson PhD, esteemed Commonwealth Prof. of Architectural History, UVA and Dir., Victorian Society in America’s Summer School, on landmark spaces of all kinds; and Jim Tucker MD, Bonner-Lowry Prof. of Psychiatry & Neurobehavioral Sciences and Dir., Division of Perceptual Studies, UVA, on his extensive research into children’s memories of past lives. Apropos Of Something hosts Ellen Daniels and Nancy Laurence talk with award-winning, investigative journalist/author Hawes Spencer, about objectively documenting the tragic events in his new book, Summer of Hate: Charlottesville, USA; and Indivisible Charlottesville Steering Committee member Ken Horne, on their strategy for creating a blue wave in the very gerrymandered state of VA.
Apropos Of Something hosts Ellen Daniels and Nancy Laurence talk with the musician Jaewar, front man for Vibe Riot, director of Vibe Fest, activist, engineer, producer, on using music to advance positive change, both locally and globally; and Lee Graves, award-winning columnist, essayist and author, on all that’s brewing in craft beers. From colonial days to its golden age. Apropos Of Something hosts Ellen Daniels and Nancy Laurence talk with Gloria Beard and Cauline Yates, participants of Charlottesville’s Pilgrimage to the National Memorial for Peace and Justice & the Legacy Museum in Montgomery, AL. Stops along the way included Appomattox, the International Civil Rights Center & Museum and the Edmund Pettus Bridge. They share their thoughts on America’s inability to confront its slave past, glorifying the Confederacy and minimizing the impact of African American contributions. Apropos Of Something hosts Ellen Daniels and Nancy Laurence talk with Lara Harrison, organizer, Hate-Free Schools Coalition, on their efforts to eliminate hate symbols from public school; and John D’earth, Prof. at UVA’s McIntire Dept. of Music & Dir. of Jazz Performance, legendary composer, arranger, musician, on why his approach to life mirrors his approach to jazz. Apropos Of Something hosts Ellen Daniels and Nancy Laurence talk with Justin G. Reid, Director of African American Programs, Virginia Humanities, on how documenting and confronting our racist past helps advance us forward; and Priscilla Mendenhall, equity activist, Cville-area Immigrant Resource and Advocacy Coalition, on advocating for immigrants’ rights in the face of an increasingly brazen ICE. Apropos Of Something hosts Ellen Daniels and Nancy Laurence talk with Aran Shetterly, narrative historian, editor, VA Humanities Fellow and author of The Americano, on his pursuit of cold cases in history thru the lens of strong characters, fast-paced plots and extensive research; and Jaewar, activist, musician, engineer, producer, front man for Vibe Riot, director of Vibe Fest, on using music as an agent of positive change. 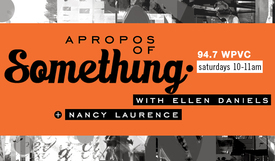 Apropos Of Something hosts Ellen Daniels and Nancy Laurence talk with Lisa Speidel PhD, Professor, Dept. of Women, Gender & Sexuality at UVA, about empowering a woman’s identity thru self-defense training and disentangling our sexually confusing culture; and Cale Jaffe JD, Professor of Law, Dir. of UVA’s Environmental and Regulatory Law Clinic, on his upcoming Supreme Court case to uphold states’ sovereignty to ban uranium mining due to environmental, health and economic concerns. Apropos Of Something hosts Ellen Daniels and Nancy Laurence talk with Deborah Parker PhD, Prof. of Italian, UVA & Mark Parker PhD, Prof. of English, Dept. Chair, James Madison Univ., about their latest book on sycophancy– observing it with disgust and delight; and Deirdre M. Enright JD, Dir. of Investigation, UVA Law School’s Innocence Project Clinic, on their concerted efforts for an Absolute Pardon of Trudy Munoz, wrongfully convicted in 2009. Apropos Of Something hosts Ellen Daniels and Nancy Laurence talk with Camilla Fojas PhD, author, editor, Assoc. Professor of Media Studies at UVA, on how race is reflected in pop culture and its impact on our national culture; and Ashley Stonemetz-Walding, Dir., Virginia Institute of Autism’s Outpatient Behavioral Services division, on providing the best support for kids, adolescents and adults as well as their families.